Do you want to step up your run game? Let our specialized Yoga classes help you become fitter and faster! There are tons of different styles and arrays of yoga in our community. This makes it challenging to choose a class that is best suited for anyone, especially someone who is a runner. 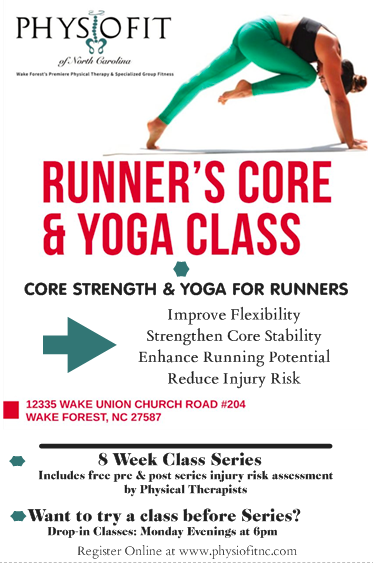 So, we created Runner's Core & Yoga Class just for you! We all know time is tight and when you're ramping up the mileage to train for your next run, the last thing you want is a time-consuming training regimen. Therefore, we developed an 8-week program with you in mind! We have 2 options based on your budget and time. Yoga has the potential to do so much good--improving strength, flexibility, core, and mental focus. The class concentrates on the ignored muscle groups that are typically very weak compared to other muscles that are constantly used in running. The strength, core work and flexibility you develop on the mat--namely in the abdominals, quads, glutes, hamstrings, and hips--can help you run more efficiently and stay injury-free. Runners' high pain thresholds coupled with their competitive natures can make them more prone to injury. Therefore, with the guidance of our in-house physical therapists that treat running injuries, we have developed a specialized Yoga Class JUST for runners. To stay healthy, active and engaged in running, endurance athletes need corrective modalities to amend muscular imbalances, prevent overuse injuries and ensure longevity in the sport. Pictures of our Daniel Hines, Yoga Instructor, with sample poses and positions to improve your flexibility and core strength specifically for runners!